The stone work of Egypt dates back to pharaonic times when a lot of household equipment were cut in stone. All Sirocco stone work is done in local stone, mostly green granite and alabaster, from the Nile area in the workshops of the area. The work with the alabaster stone origins from the pharaonic era of Egypt. The alabaster stone exists in different shades of white and beige and in different densities of stone crystals. Most of the stone used by Sirocco is a matte crystallized snow white stone. 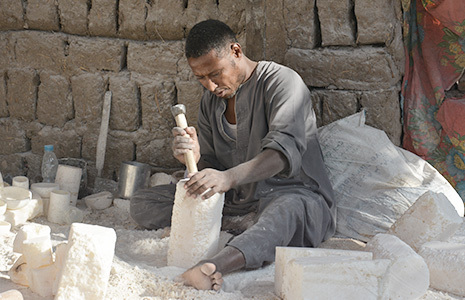 The alabaster mountains are in the Luxor area and so are most of the work-shops. All the work is done by hand and the process goes through many steps. In order for the fine crystals in the stone not to break, the cutting must be done gradually over days. In the night the stone is left wrapped in cotton with glue and each day a layer of the stone is cut off until the final shape is achieved. Tucked away in the back alleys of the crowded Khan El Khalili souk of Cairo lies the coppersmith area. The traditional craft of shaping the copper or brass manually and decorating the metal with intricate patterns of small holes dates back to the Ottoman empire and the first old city of Cairo. Compressed through thousands of years in the underground around the oasis of Siwa is a dense layer of salt. 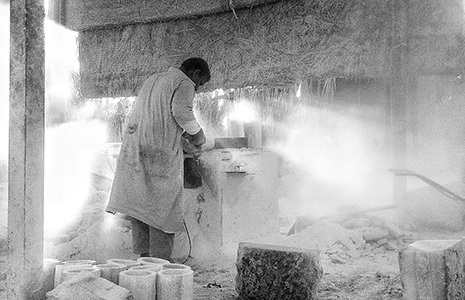 From great blocks of this salt the artisan is able to carve shapes and form beautiful pieces. Visible in the salt is stripes of grey-brown sand, these stripes are remnants of the great sandstorms roaming the area throughout the years. The light filtered through the salt crystals is an amazingly soft and pleasant light. On our cushion covers and bedspreads you will find the elegant and intricate embroideries of the women of the Siwa oasis in the Sahara Desert. This unique artisanship is handed down form mother to daughter since the dawn of the berber population of the oasis. We use the traditional symbolic patterns but adapted into contemporary designs. This way we aim to blow new energy and creativity into the ancient craft as well as paying the appropriate tribute to the traditional designs and their meaning. 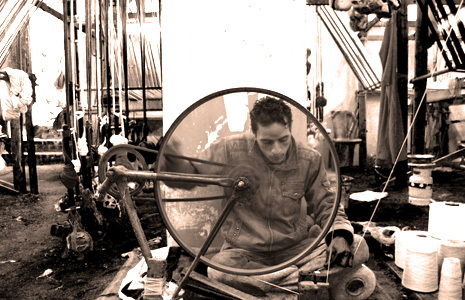 Our hand made textile comes from two small villages in Egypt. One is located in the outskirts of Cairo in an area famous for its textile. In the old times this small village and the Siwa oasis were connected via the caravan route. Here we work with a family business who are specialized in the traditional patterns of the different areas of Egypt. The other village is set on the Nile in the south of Egypt. Also a family owned business the weavers create beautiful materials in techniques known only to this specific area. The pure wool kelim carpets and cushions is inspired by traditional beduin patterns. 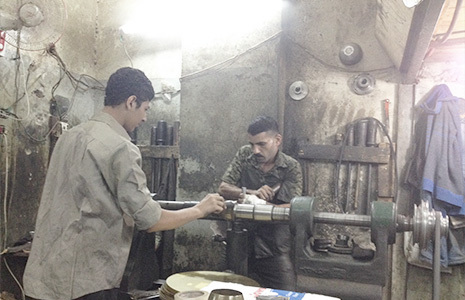 The craftsmen are working from a small factory in the part of Cairo called Khiamia. A truly magical place that still takes your thoughts centuries back in time. In the midst of the vast Qatar Depression of Sahara the small oasis of Al Gara is situated. Nestled in lush bright palm tree gardens and deep green olive trees is the little village that produces our basketry. 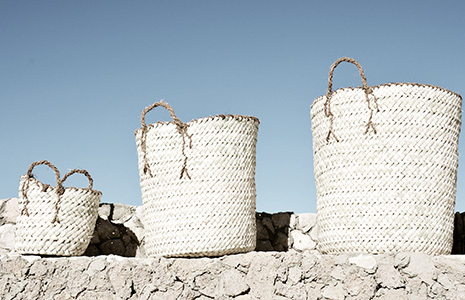 The basketry is a traditional craft still being used in every day life by the villagers. They use the baskets for collecting dates and olives and for bread preservation. In the past the Desert people used the baskets for most of their dayly work. This included to carrie stones and mud, when building their traditional mudhouses. The baskets are made from the palm leaves cut off every year when the tree is trimmed to grow higher. The fiber is exceptional strong and lasts for several years; even under hard weather conditions.